We delighted to announce the launch of a new research report: An Analysis of Executive and Non-Executive Director Pay 2008/09 - 2012/13 published by Verum Financial Research. This unique research analyses FTSE 100 directors' pay against company performance based on the Verum value composite performance index. Remuneration committees within UK public companies have the responsibility for setting executive packages for the top earners within the company. 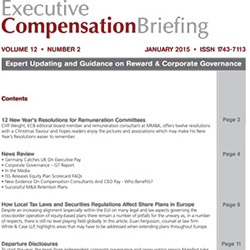 Executive Compensation Briefing (ECB), with its insight provided by industry advisors provides a short-cut to many of the technical issues this responsibility carries with it. For over 10 years, ECB has been the go-to reference for news and analysis of the last developments in the remuneration and benefits industry. Its easy to read, and accessible format is sent direct to subscribers on a monthly basis. Many of ECB's subscribers - taken from among the country's largest companies - have been relying on it since its launch for timely and need-to-know commentary of what is a highly technical and challenging industry. 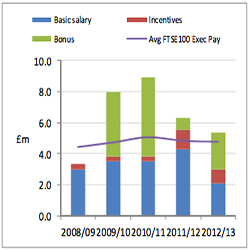 Who reads Executive Compensation Briefing (ECB)? ECB provides both information and guidance, so that readers can be confident that nothing has got under the radar. ECB allows readers to challenge assumptions and to champion the right decisions from a position of strength to get it right first time. ECB is independent, with no axe to grind and no hidden agenda; with remuneration currently under the spotlight, it understands the pressures from shareholders and the media - and colleague.